Business research and teaching institutions play an important role in shaping the way businesses perceive their relations to the broader society and its moral expectations. Hence, as ethical scandals recently arose in the business world, questions related to the civic responsibilities of business scholars and to the role business schools play in society have gained wider interest. In this article, I argue that these ethical shortcomings are at least partly resulting from the mainstream business model with its taken-for granted basic assumptions such as specialization or the value-neutrality of business research. Redefining the roles and civic responsibilities of business scholars for business practice implies therefore a thorough analysis of these assumptions if not their redefinition. The taken-for-grantedness of the mainstream business model is questioned by the transformation of the societal context in which business activities are embedded. Its value-neutrality in turn is challenged by self-fulfilling prophecy effects, which highlight the normative influence of business schools. In order to critically discuss some basic assumptions of mainstream business theory, I propose to draw parallels with the corporate citizenship concept and the stakeholder theory. Their integrated approach of the relation between business practice and the broader society provides interesting insights for the social reembedding of business research and teaching. The author wants to thank Guido Palazzo for his precious comments on earlier versions of the paper. Anderson, S., Cavanagh, J., Hartman, C., Klinger, S. & Chan, S. (2004). Executive Excess 2004. campaign contributions, outsourcing, unexpensed stock options and rising CEO Pay. (Washington: Institute for Policy Studies), Retrieved 2007-05-11 from http://faireconomy.org/press/2001/EE2001.pdf. Aspen Institute (2002). Where will they lead? MBA student attitudes about business & society, Retrieved 2005-04-12 from https://www.aspeninstitute.org/AspenInstitute/files/CCLIBRARYFILES/FILENAME/0000000203/sas.pdf. Boyce, G. (2006). 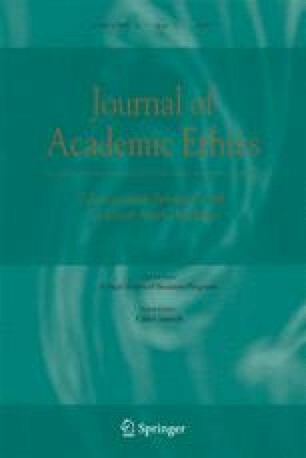 The social relevance of ethics education in a global(ising) era: From individual dilemmas to systemic crisis. Critical Perspectives on Accounting, doi:10.1016/j.cpa.2006.09.008. Fallis, G. (2004). The Mission of the University. Toronto: York University, Department of Economics and Division of Social Science, Retrieved 2007-05-11 from http://www.cou.on.ca/content/objects/The%20Mission%20V3.pdf. Reiter, K. A. (2000). Harvard class of 2000 urged to pledge social responsibility. Harvard Crimson (March 20), retrieved 2007-04-25 from http://www.sriendowment.org/files/03-20-2000-harvard.pdf. Weiss, T. (2006). New lessons in corporate citizenship, Forbes, Retrieved 2006-11-29 from http://www.forbes.com/corporatecitizenship/2006/11/28/leadership-philanthropy-csr-lead-citizen-cx_tw_1128mba.html.